Looking for new ways to bring the past to life at your school? Living history performer, teacher and storyteller Karen Haas will bring a cassette crammed with Fur Trade treasures, a firkin full of Oregon Trail tools, and ideas galore guaranteed to get your students as excited about history as she is. Everyone's a storyteller, some people just don't know it yet! Discover your hidden talents at this fun and interactive workshop. If you're tantalized by the thought of traveling back in time, discover the next best thing: living history. This lively and interactive workshop will get you started on the road to recreating the past with topics such as effective research techniques, deciding on a persona, building your persona's character and creating historic clothing. 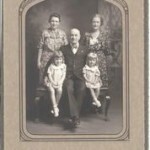 Genealogy’s all the rage, but how does one keep the family stories alive? Whether you've researched your family tree or are just beginning, this workshop will inspire you with plenty of new tips and ideas. 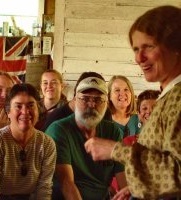 Living History comes in all shapes and forms, from elaborate extravaganzas to simple one-on-one demonstrations. It can take place anywhere - at historic sites, schools, libraries and senior centers, just to name a few. Whether you have experience as a teacher, docent, tour guide, ranger, or are just curious, if you enjoy sharing history and want to improve that sharing, Karen has a workshop for you. 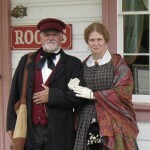 Let her know your needs, and she’ll design a program that’s perfect for your group with topics such as interpretation, effective research techniques, performance techniques, using living history in the classroom, building your personae’s character and creating historic clothing.